As usual major HECM news comes either in the middle of one of its conventions (or regional conferences) or just after it concludes. The tone of the NRMLA Western Regional Conference was upbeat and somewhat irrationally exuberant. The wording is so general as to question whether not only the MMIF but also the G&SRIF might not also have to be addressed. It is clear that at least the MMIF portion of the HECM program is now under the spotlight at least to some degree. 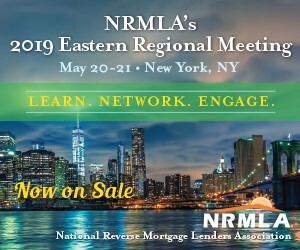 The MMIF is in trouble and no matter what NRMLA is doing to help with the MMIF by making its latest suggestions, will their suggested changes have ANY impact on the determinations of the HUD’s independent actuaries? At the conference there was noise about saving the MMIF billions through these suggested changes. Such claims cannot be tested for their size or if they are at all accurate. Since Facebook will STILL carry the ability to target by age in other categories, I do believe that Reverse Mortgage marketing will still be available as this is a age limited product. I believe that one could protest Facebook’s first look at the ad, and just like today, when you point out the product is only for those 62 and older, they will let the ad be displayed. However, there is something to be said for also targeting the younger generation who may have parents of the proper age, or even upcoming Baby Boomer who still need to be thinking about the future. I believe we can work together to find a compromise. Perhaps but if I were the decision maker at FB, I would decline the rational not because of right or wrong but rather for concern over angering regulators and any related legal costs. But it needs to be tried by several to see if there is a way around initial objections. I think we need to brush up on Jumbo products and become very comfortable with them if HUD puts another bullet to the HECM. This may become our last option if we want to stay in the reverse space. It will surprise many but total endorsements for the first SIX months of fiscal 2019 only amounted to 15,618 HECM endorsements. Yet we saw 29,832 HECM endorsements during the first six months of fiscal 2018. For those who are so excited for the remainder of fiscal 2019, what is the source of this excitement, the rather small number of proprietary reverse mortgages closed so far in 2019? When industries fail to provide production numbers but boldly talk of their gains, one can be assured that the quality of such self analysis is what is known in the world of advertising as expedient exaggeration (from the movie “North by Northwest”). The year long effort of NRMLA to show that the actuaries were using unreasonable assumptions and made incorrect determinations ended with NRMLA walking away simply suggesting ways to fix perceived backend problems..That means NRMLA did not come up with any significant problems in the assumptions, calculations, and conclusions of the independent actuaries for fiscal 2017. Fixing the “assumption, calculation, and conclusion problems” in the actuarial reports was the hope of the industry as to dealing with the HECM losses in the MMIF. We need a far better HECM financial model to adequately mitigate the current risk in the HECM program. As many know I strongly support Geocentric PLFs rather than PLFs based on national averages, especially since the principal components that drive home appreciation are LOCAL, LOCAL, and LOCAL.